As a half-sister by Shamus Award to Golden Slipper winner She Will Reign there has always been a lot of interest in this talented filly, who cast off maiden status at Hawkesbury on Wednesday. Trained by Bjorn Baker, Rosina Kojonup has always shown above average ability at the trials, so much so that she made her debut earlier this year in the Listed Woodlands Stud Stakes at the Scone stand alone day on May. On that occasion, she failed to fire, but given a good spell and allowed time to mature she returned in the 1000 metre maiden and led all the way to score an easy win. She was a well backed favourite and there was a good margin back to the third horse, so it was an encouraging performance giving hint of better things to come. 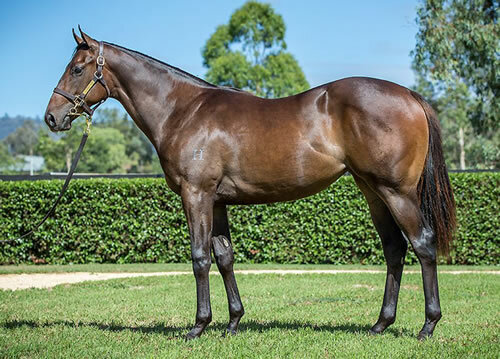 A $425,000 Inglis Easter purchase from the Yarraman Park draft for Attunga Stud/ Blandford Bloodstock, Rosina Kojonup is the third winner from three foals to race from Courgette, a metro winning Charge Forward mare, whose grand-dam is Group II winner Sunshine Sally. Courgette’s other two winners are Champion 2YO Filly and $3million earner She Will Reign, who also won the Group I MVRC Moir Stakes to go alongside her Group I win in the ATC Golden Slipper, and this season’s undefeated two year-old Time to Reign. Courgette changed hands at the Magic Millions National Broodmare Sale earlier this year fetching $2.1 million when bought by E Thoroughbreds with a positive test to I Am Invincible on a late service date. Her current yearling is a filly by Time to Reign’s sire Time for War. Rosina Kojonup is the tenth winner this season for Widden Stud’s Cox Plate winner Shamus Award, who has had a good run through the spring with six winners since the start of the month. Shamus Award stands at a fee of $11,000.